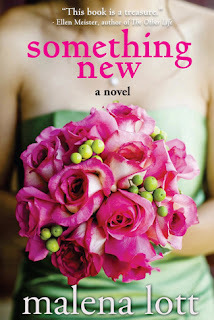 I've had Something New by Malena Lott on my to read list for a while and I read it over Christmas break. I read it in a weekend (actually the weekend before Christmas). I loved it and didn't want to put it down. It's been on my reading list for a while because I don't read a lot of romance, but Something New is so much more than a romance novel. I so identified with Kelly - the dependable family member that always does what is expected of her. Something New is a modern day fairy tale of a family with old money - real estate wealthy, but cash poor - with a number of secrets. Three generations of Apple women have done the "right" thing, followed the path that was expected, endured the life they led all in the name of Apple. However, following expectations doesn't always lead to happiness as these four women discover. At the start of the story, Kelly has sworn off men, but wants a baby. Her sister is getting married on a national television show because of her shopping addiction debt. Her parents are divorcing and her mother is tired of pretending. Her grandmother, the matriarch of the family, is succumbing to dementia and holds the biggest secret of them all - one that will shake the family to the core (no pun intended). In a lot of ways the Apple family is experience growing pains. And while it is set-up to be a book of self-discovery for Kelly, or at least that is what you believe in the beginning, it is truly a multi-generational revelation in the end. The multi-generational perspective reminded me of The Friday Night Knit Club. Though I identified with Kelly, the three other women are not just in the wings. I think it would be just as easy for another reader to pick up the book and say Mae is the star, while someone else may say Gwen. It really depends on which character you relate to the most and they get pretty equal attention. And though I thought the women were a little slow to catching on to Mauve's secret, it was fun following their journey. Something New is a story about growing up, growing closer, and finding love in unexpected places. For those who enjoy stories of strength, bonding, and being true to oneself, Something New should be your next read. Girl Who Reads is an advertising affiliate with Amazon and IndieBound; a small fee is earned when purchases are made using the above links. A free book was obtained from the source mentioned above in order to provide an honest and free review.